Yuuguu is an screen sharing platform for IM clients. Now Yuugu is fully integrated with Skype - allowing you to instantly share your screen with your friends on Skype with just one click. Yuuguu's Skype integration works with Skype for Windows and Skype for Mac. 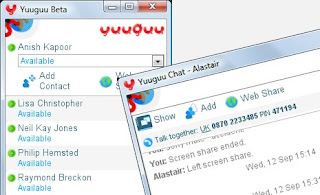 It allows you to combine your Skype contact list, with your existing contacts on other instant messaging networks like AOL, Yahoo, MSN and Google Talk as well. There are no downloads or anything to install for your Skype buddies. They can join your screen sharing session through a standard browser. You can choose to turn the screen sharing session into a real time collaboration session, by sharing control of your keyboard and mouse so you can work together on any document or application on your computer.